Apple outpaced the smartphone industry's average growth of 79.7 percent in the first calendar quarter of 2011 to edge out RIM as the second largest producer of smartphones behind Nokia. Apple sold 18.7 million iPhones in the quarter, giving it an 18.7 percent share of the market, which happened to total almost exactly 100 million devices. That put Apple within 6 million units of first place Nokia, which grew only 12.6 percent over the year ago quarter, dropping its leading share of the smartphone market from 38.8 percent to just 24.3 percent. IDC commented that "as Nokia transitions from Symbian to Windows Phone, it may find itself in danger of ceding market share as the competition ramps up smartphone production." 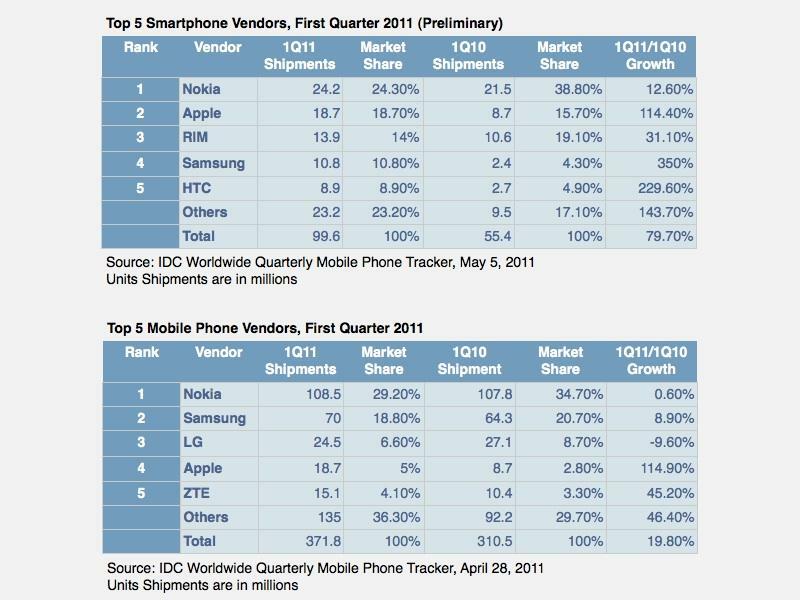 RIM grew by just 31.1 percent, less than half the industry average, while Samsung grew by a tremendous 350 percent, although it was growing from sales of just 2.4 million a year ago, and is still less than half the size of Apple as a smartphone vendor. IDC remarked that Samsung is producing Android phones in addition to its own Bada-powered Wave devices and Windows Phone 7 models running software licensed from Microsoft. The firm said sales of all three platforms "continued to gain traction." HTC also grew its sales dramatically by 229.6 percent, although it too started with shipments of just 2.7 million last year. Other smartphone makers grew by 143.7 percent collectively, and amount to 23.2 percent of the market. IDC announced last week that Apple was fourth among all vendors of mobile phones, behind Nokia, Samsung, and LG, although Apple posted outstanding growth of 114.9 percent, while the top three vendors grew by just 8.9 percent (Samsung), remained flat (Nokia, with 0.6 percent growth) or contracted (LG, which lost 9.6 percent of its sales volume compared to the year ago quarter. Overall growth in mobile phones was just 19.8 percent, far less than the huge surge in demand pushing sales of smartphones among consumers globally.